I have not posted for a while, as I have been busy with our middle school musical and raising my own boys. To be honest, the news front in technology for music education has been pretty quiet as of late. Earlier today, Apple announced a new iPad which replaces the iPad Air 2, for $329, which isn’t a device that you want for yourself (you want to wait for the new iPad Pro)–it is a device that is meant for schools or for kids. With a school discount, the new iPad is $299, which places it firmly in Chromebook territory (and nearly $150 cheaper than the best Chromebooks for schools, such as the new Samsung flip models). In the past, if you wanted the cheapest iPad, you had to buy an older generation iPad–Apple changed this today. We’re still waiting for new iPad Pro models–which is what I am waiting for, too. PhotoScore & NotateMe Ultimate 8.8 and AudioScore Ultimate 8.8 are available to download. Featuring the latest in cutting-edge music AI, existing version 8 customers can update for free. Version 1-7 customers can upgrade for a discounted price. AudioScore Ultimate 8.8 offers significantly improved audio-separation and transcription abilities to help you discover the notation within MP3 and CD tracks. PhotoScore & NotateMe Ultimate 8.8 features NotateMe 4 music-handwriting technology for composing on-the-go with the Microsoft Surface Pen, in addition to user-interface, editing and recognition improvements. NotateMe 4 and the free NotateMe Now 4 are also available for iPad Pro with Apple Pencil and Samsung Galaxy Note with S Pen. Finally, the new Hit’n’Mix 2.5 (which powers AudioScore 8.8 audio processing) is available separately for ripping out and manipulating individual notes and audio from full-mix tracks – more details at hitnmix.com. Furthermore, if you should wish to upgrade from a previous generation of software, Neuratron has made it simpler to do so (I believe that they sent out an e-mail to existing customers). I have not had a chance to play with the updated versions of the software–my workflow at this time of the year does not require any scanning, and I don’t have an iPad Pro to try NotateMe’s new Apple Pencil functionality. From my personal experience, there is no better scanning software on the planet than Neuratron’s PhotoScore, either the desktop/notebook version, or the In-App Purchase found with NotateMe on iOS or Android. The desktop/notebook version sells for about $250, the app version is about $70. Yes–you will have to edit a score, but it is amazing how much time these applications can save you. There are some other wonderful scanning solutions (some that are significantly less expensive), but Neuratron’s products are the gold standard of the industry and I recommend them wholeheartedly! If you want to scan music on your iOS device (Music Optical Character Recognition), there are only two options worth investigating. Both represent a minimal commitment versus traditional scanning. Traditional scanning required a computer, scanner, and specific software in the $250 range. There are two “major” scanning programs: Neuratron’s PhotoScore (8) and Musitek’s SmartScore X2. From personal experience, I recommend PhotoScore as the best solution, although SmartScore X2 has improved dramatically. If you are working with an existing PDF generated by a notation program, you may also want to check out PDFtoMusic Pro, another $250 app, that converts existing PDFs into MusicXML files. If you have a mobile device, the leader in the category in Neuratron, whose app NotateMe ($40) can be used to write music by hand–but in my opinion, its In App Purchase (IAP) of $30 that adds PhotoScore to NotateMe is a game changer. In many of my trials, my iPhone scans as accurately as Neuratron’s desktop/notebook program, at 1/3 the overall price. There is also a free version of NotateMe, called NotateMe Now, which will let you try a single staff, as well as to scan a single staff. It is also important to mention that NotateMe is also available on Android, and Neuratron really likes the Android platform. Still, for some users, $70 for an app is too hard to swallow–even it if means a significant reduction in work load. That is why Sheet Music Scanner took me by surprise when it added the ability to export a MusicXML file. Sheet Music Scanner is a $4 app that allows you to convert music to be played. That didn’t really meet any of my needs as a music educator, although I can see how it would be valuable to “amateur” musicians (i.e. musicians without college degrees that had to take years of theory). This summer, the app added the ability to export data to a number of formats, including MusicXML, and this changed my entire view of the app. It also turns out that Sheet Music Scanner can scan from photos, or open a stored PDF for scanning. As of today, Sheet Music Scanner is the only iOS app that can handle recognition of a PDF (NotateMe requires a physical copy to actually take a picture of). That app was updated today, and now allows for scans of longer documents. Early on, I tried a 37 page Bach cantata, which crashed. The program will now handle that document. Additionally, the app now allows for transposition. You can change the key on the fly; and furthermore, if you export the transposed song, it will export in that new key, too. I just tested this on the same cantata–and it worked. Sure, there are things I need to fix. I am okay with that. No matter what program I use, clean-up is required. Ever have a song that you needed transposed on the spot? Here’s your solution! I also love that I can open a document from Dropbox to Sheet Music Scanner to Notion on my iPad. This is one step closer to a world where a “traditional” computer isn’t needed. If you want to scan with as much accuracy as possible, Neuratron’s products are what you will want to use. For example, our orchestra teacher needed a bassoon part from a movement of one of Beethoven’s symphonies written for a Bass Clarinet. With PhotoScore (on my iPhone), I was able to scan that part with a high degree of accuracy, including diacritical markings (accents, staccatos, dynamics), and my editing time was mainly entering multi-measure rests, adjusting some slurs, and adding symbolic crescendo markings. There were only a few actual notes to correct. Re-entering the score by hand would have taken hours–I was able to do it in less than 45 minutes with the NotateMe app, Finale, and Notion (I like to mass edit in Finale, and to do final editing with Notion). This is a very different function than making a set of rehearsal tracks for a choir. Remember…MakeMusic just removed SmartScore’s scanning out of Finale 25. You likely need a way to scan music. And I don’t know about you, but SmartScore lite always resulted in a mess for me. Here is a $4 solution to replace that program with something that is already better. Need more accuracy? Neuratron is available. I don’t feel bad about endorsing both products–in a world with eight well-known notation programs (Finale, Sibelius, Dorico, Notion, MuseScore, StaffPad, Noteflight, and Flat.io) and many less known programs, there is certainly room for two or three scanning apps. If you don’t own it yet, Sheet Music Scanner will be a wonderful tool in your app collection, and it would be my “App of the Year” for 2016. The developer keeps improving the app and $4 is a cup of coffee in today’s world–go download it today. Sheet Music Scanner: MusicXML ready! Some time ago, I blogged about a couple of apps that could take a picture of your music and play it back for you. To be honest, I can see some use for such a feature–but I needed a scanning app to do more. I need scanning apps to be accurate and export MusicXML to another program. Well, the developer of Sheet Music Scanner took that feedback and kept working on their app. To make a long story short, I have been pretty sick (when you hear the new episode of our podcast, you will know what I am saying) and I also was a bit dismissive of the app after trying it out originally. I put off testing of the new features when I should have been looking at the app with an open mind. Once again, I made a foolish mistake. Lesson learned (once again): never assume that because something doesn’t meet your needs that it cannot improve to meet your needs. You can open a PDF from an online storage location (iCloud, Dropbox, Google Drive) and recognize the score. No other scanning app for iOS deals with PDFs. You can export to MusicXML. I did edit the first measure which ended up having an additional half note, no time signature, and no key signature (the key signature began in measure 4). That editing took all of 20 seconds. The end result was a highly accurate scan–with the exception of the multi-measure rests on the next pages. There are a number of things the app does not do (yet), such as: triplets / tuplets, percussion notation, dynamics, also double sharps, double flats and grace notes. These are all on the developer’s roadmap over the next year. It also doesn’t scan lyrics, and after initially being disappointed in that, I wonder if that isn’t just a blessing in disguise? As the app just “gives you the notes,” doesn’t that make it a better teaching tool rather than a tool for copyright infringement? The app also doesn’t include diacritical markings like accents, staccatos, etc. And to be honest, if you need to add those, use Notion and its new handwriting feature. 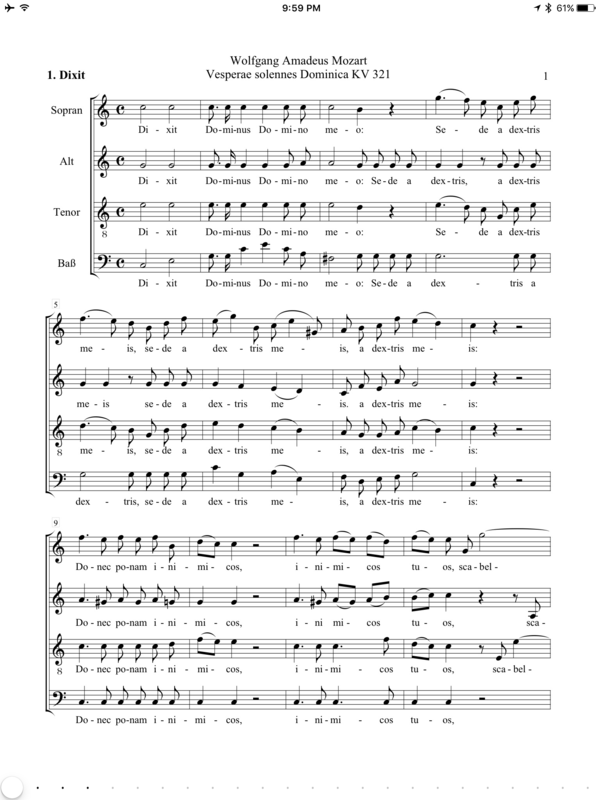 I did try a 37 page double-choir Bach score, which the app crashed on. I don’t blame the app–I have seen live choirs crash on the same literature! Here is the amazing thing: the app is $3.99. You will have to do some clean-up, and you will need to do some editing. But this is a developer who has figured out how to scan music, in an industry that has been developing similar products for 20 years or more! There is no doubt that NotateMe with the PhotoScore In-App Purchase is more accurate than Sheet Music Scanner, or that it scans for more things–but the NotateMe package is $70 (already a better investment than computer apps that do the same thing)–and Sheet Music Scanner is $3.99. 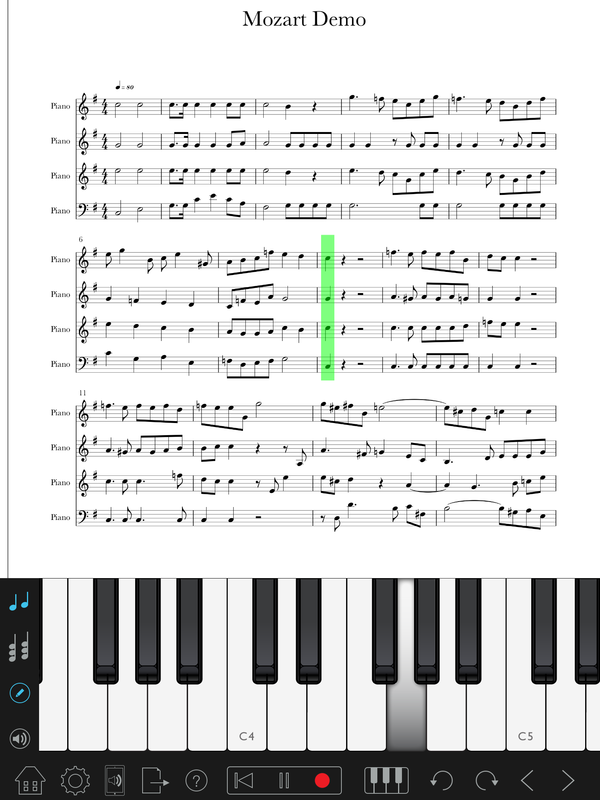 Seriously–go spend the $3.99 for Sheet Music Scanner and $25.00 for Notion (buy the handwriting feature) and try out this combo for yourself. I think you will be amazed at what you can do!